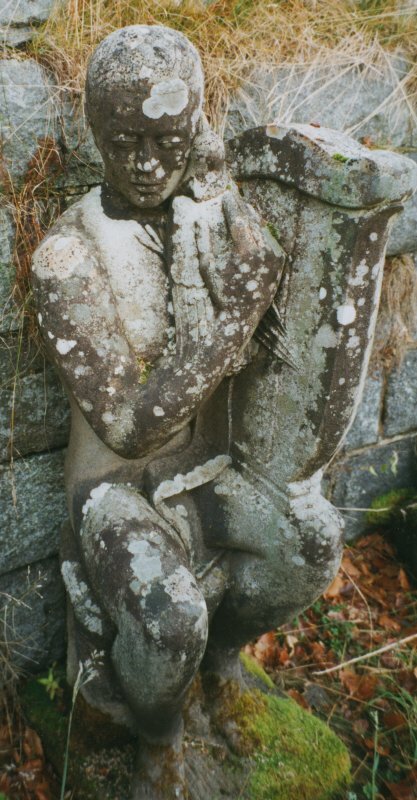 View of Hew Lorimer's sculpture of Orpheus in Corrour garden. Interior view of drawing room. 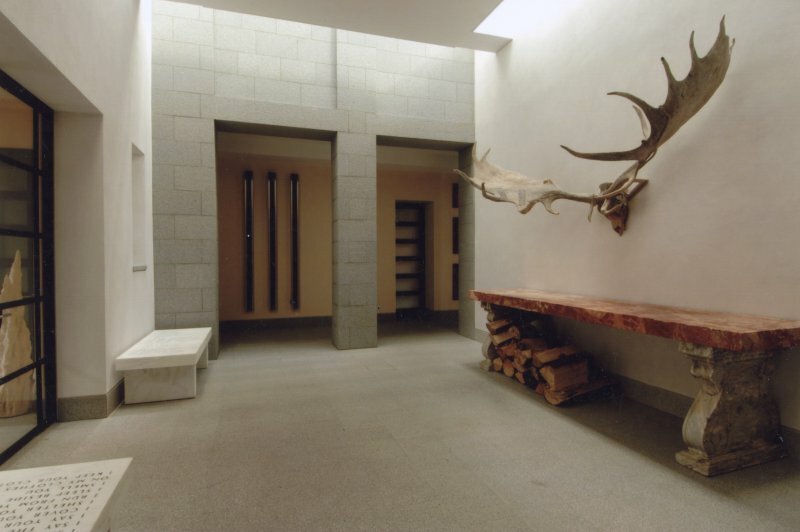 Corrour Lodge, Moshe Safdie & Assocs, with Ne Begg, 1999-2004 Shooting lodge at the head of Loch Ossian, built of silvery Portuguese granite, steel and glass between the surviving arms of its Edwardian predecessor. A hard-edged, geometric composition in an idiom daringly alien to the Highlands, it nonetheless expresses something of the stark grandeur of its surrounds. There is a suggestion, too, of tower and broch-like forms in the principal blocks - one rectilinear, one cylindrical - rent by glass semi-conical or pyramidal shafts which thrust up through the masonry like shards of ice. Behind, a vast glazed barrel roof rolls down from a crenellated parapet towards two single-storey, curving, flatroofed extensions - a pair of library/studies. 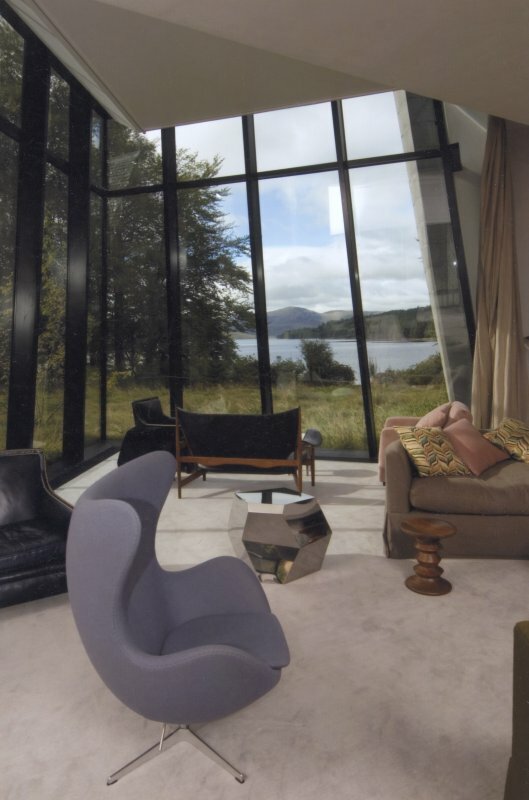 The interior juxtaposes granite-pillared austerity with a strong Scandanavian vein: 20th-century and contemporary furnishings, paintings and textiles mixed with some antiques, all viewed, thanks to the great shafts of glass, against the glorious backdrop of Loch Ossian and its plantations, and the wilder hills beyond. The Edwardian crowstepped wings now accommodate two cottages and estate office on the left (formerly the old schoolhouse and deer larder), and a detached self catering cottage in the former chapel on the right, atmospherically panelled with distressed timber planks, and with box beds and other folksy fittings. Garden Architectural layout by L. and J. Falconer, c.1904, but very much the creation of the Stirling Maxwells; restored and revived with looser naturalistic planting by Jinny Blom, 2004. Curving steps lead down from the lodge to a sub-alpine garden on the margin of the Loch. There is a circular lily pond, in the middle of which stood Hew Lorimer's statue of Orpheus (now moved to the edge of the terrace), below which a rockery of latticed beds descends to a polygonal stone landing stage. Other outlets for Stirling Maxwell's horticultural interests at Corrour were his arboretum, rhododendron garden, and pioneering conifer plantations of 1892. A recent addition is Antony Gormley's sculpture Hear and Hear in a pine grove by the old steamer pier. Nearby is a grass-roofed sauna, a prefabricated timber kit imported from Norway. Complex of ancillary buildings south of the Lodge, refurbished or rebuilt 2004 by Morris & Steedman Assocs. These include reinstated kennels, workshop, stables, gillies' flat, deerlarder, boathouse and community hall. Whitewashed buildings with curly skewputts of the 1890s, now refurbished, with external timberwork refreshed in the estate's trademark arctic blue, include: the Head Stalker's House and its cute partner, the Doll's House (former gardener's cottage); Corrie Creagach, a complex of staff cottages (now available for self-catering lets), and the former stables/coach house. 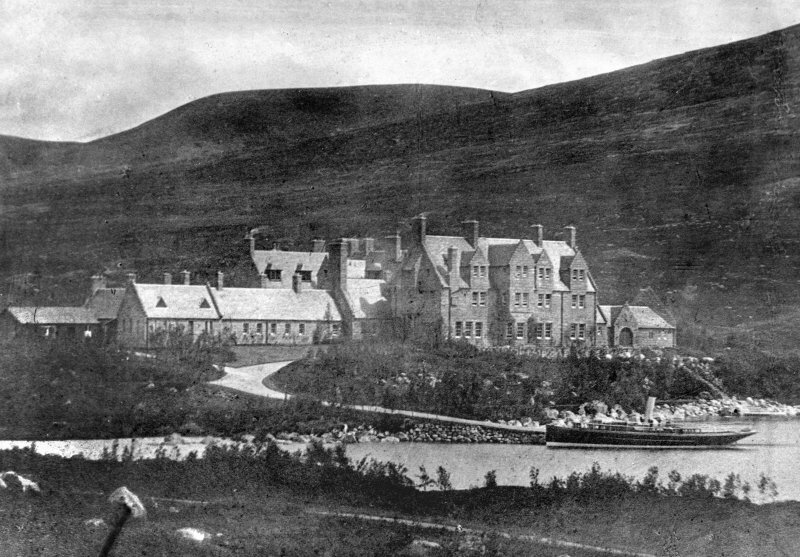 Corrour Lodge built 1894 and burnt down April 1942. New lodge built on same site 1959. Architect:- Reginald Fairlie 1935. Alterations and additions for Sir John Stirling Maxwell.